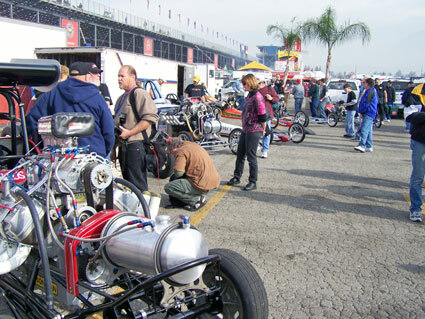 Pomona, CA February 09-11: The cacklecars were invited and they came - 26 in all. 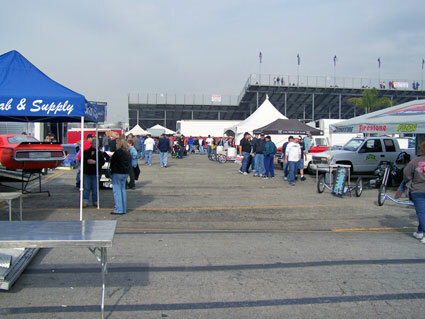 NHRA gave them all the pit space they needed in a prime location behind the grandstands. Everyone arrived and set up on time... all was well. 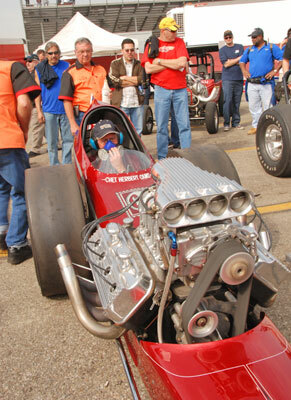 Even though a chance of rain was predicted for Friday and Saturday none came. 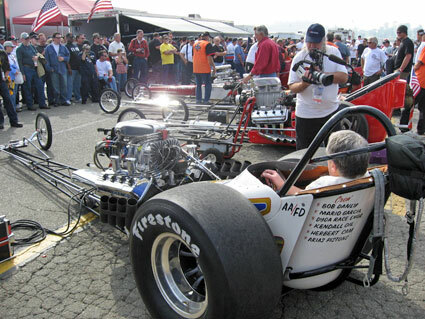 For two days the cacklecars did several static fire ups attracting hundreds of fans. 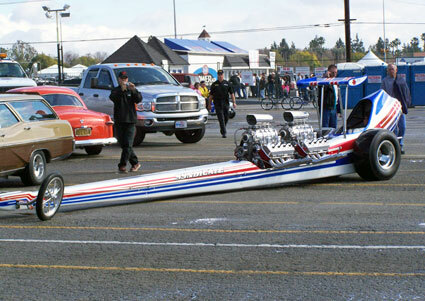 Their segment of the show was to go off between the semi finals and final rounds on Sunday. 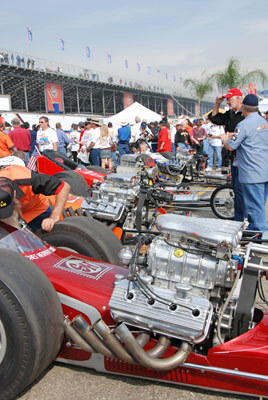 It was to be the largest presentation of these vintage warriors ever at an NHRA national event. Was to be are the key words. 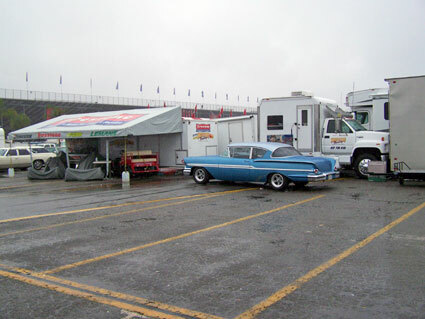 Saturday night the rain, that had stalled for many hours, broke through and continued until 11 AM Sunday morning washing away any chance they had for "filler shows" which included the Cacklefest and Nostalgia Top Fuel and Funny car exhibition runs. 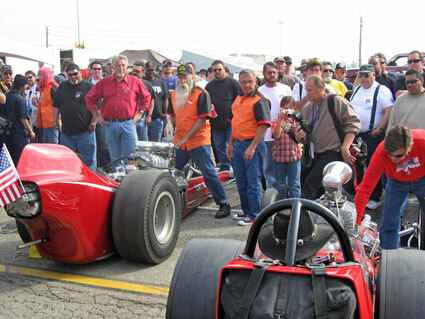 Not for the first time and assuredly not the last, Mother Nature changed the course of a drag race and the losers were the fans who didn't get to see the fabled Pomona track featuring one push start after another. 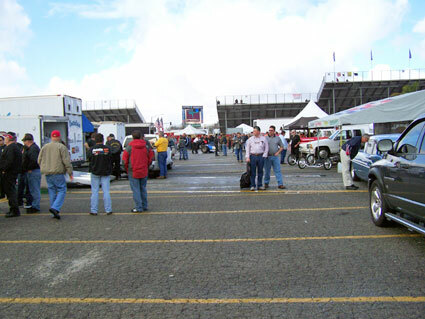 Incredibly, after shorting the Pro turn-around times to 60 minutes, NHRA got the track dried and finished the entire program within the TV time restrictions. 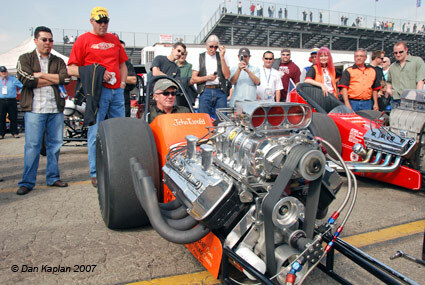 It was no ones fault we didn't get to do the Cacklefest but the thousands of fans in attendance knew we were there. 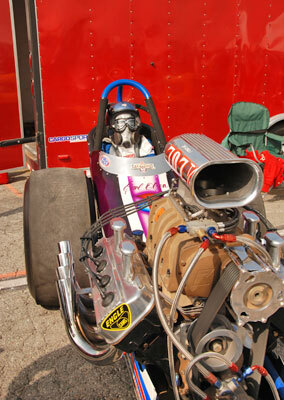 Here are some shots from the weekend. Needless to say, the coverage would have been spectacular had the Cacklefest actually happened. 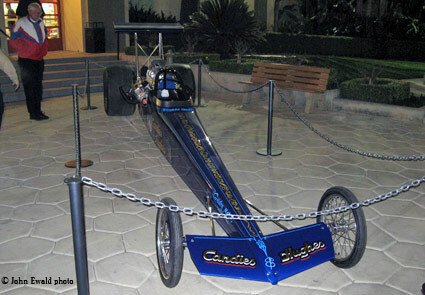 The Belle of this ball was the debut of the beautifully restored Wale & Candies 1963 dragster. As always, Pat Foster did an incredible job of bringing this piece back to life. 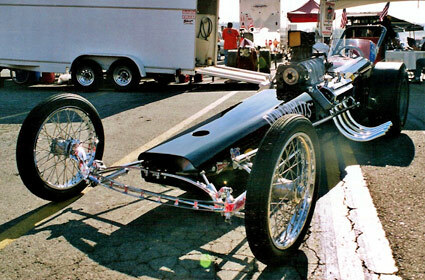 Paul (Candies) has kept this car in his possession since it was replaced by a later model in 1965. 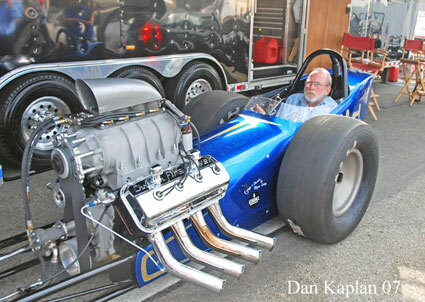 Dale Armstrong built the engine for the restoration and as one would expect, it sounded stout. 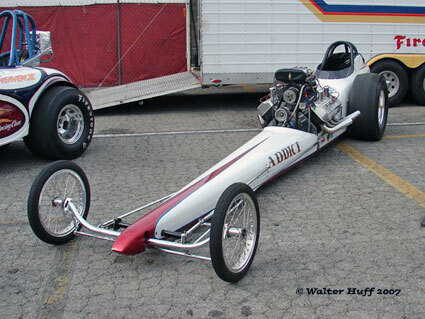 Although it is not a cacklecar, this was the other half of Paul's double hitter - another Foster restoration - the 1976 NHRA Winston Top Fuel championship car of Candies & Hughes that was driven by the multi-talented Richard Tharp. 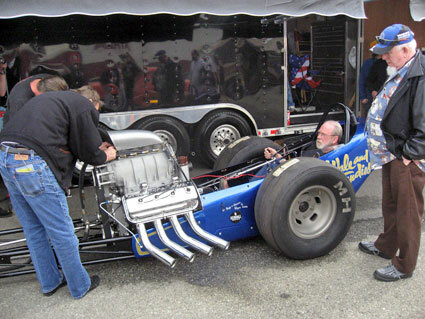 As is the Wale & Candies car, this is drop dead gorgeous and it was no surprise to anyone who knows him when Paul officially donated it to the Wally Parks NHRA Motorsports Museum on Thursday night during Wally's 94th Birthday Bash. 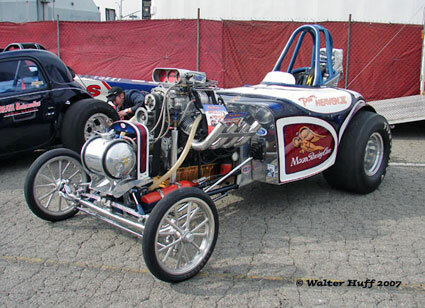 Paul Candies and his sons with the latest member of the cacklecar family. 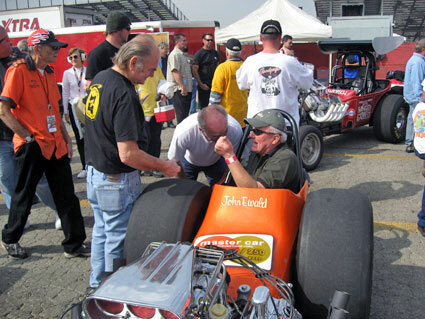 From the first people in the gate the cacklecars were not only a huge draw for the fans but also a great meeting place for the legends of the sport. 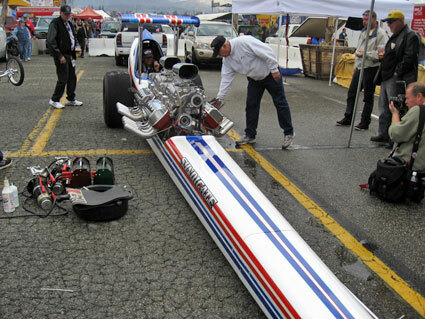 Al Bergler's "More Aggravation" is hard to miss at any event. 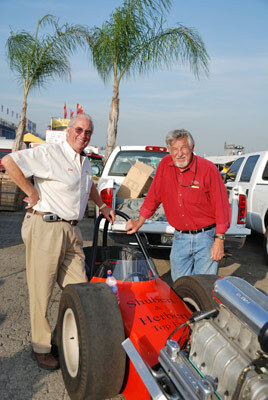 Ron Johnson and Steve "The Organizer" Gibbs with the Shubert & Herbert car. The Wing is back! 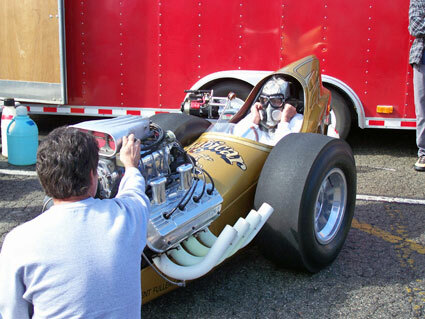 After a crash at the 2005 VRA Finals, the car was completely redone over the 2006 season and is now officially back in action. This is great news for the fans. 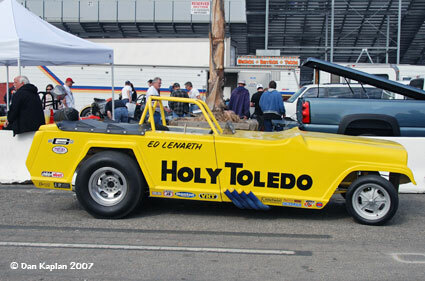 Ed Lenarth's "Holy Toledo" was the lone Funny Car in the group. 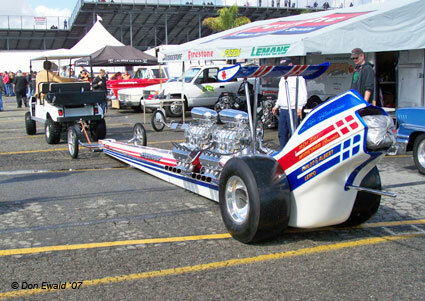 Pure Heaven made the short tow from the museum to the track on Thursday. 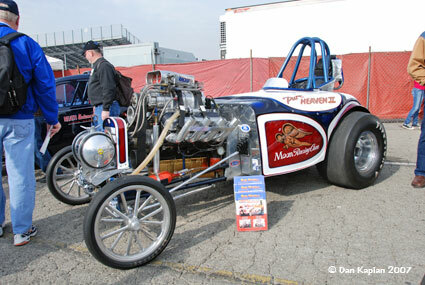 Team cars, Norm Weekly with the "Frantic 4" and Dennis Prater's "Stellings & Hampshire". 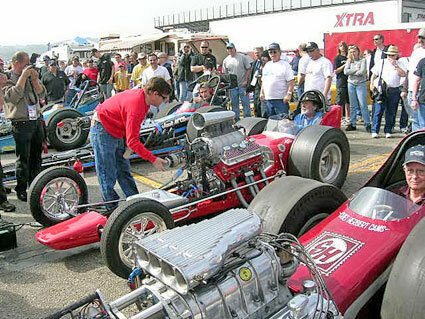 John Ewald's traveling road show - the BankAmericar and Mastercar. 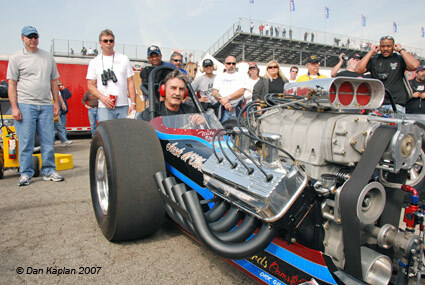 Sonny Messner was on hand with his Swamp Rat III recreation. 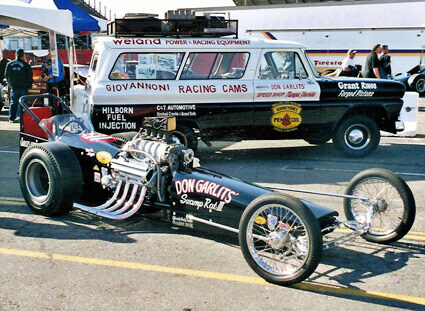 Don Garlits, in for the Cacklefest in Messner's car, was all over the place. 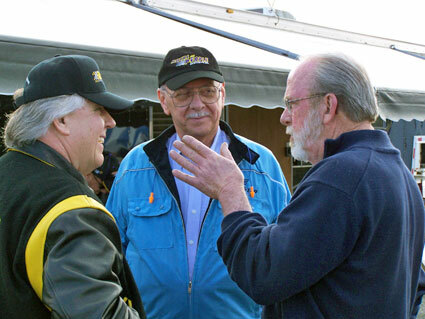 Here he chats with Dennis Prater and "Wild Bill" Alexander. 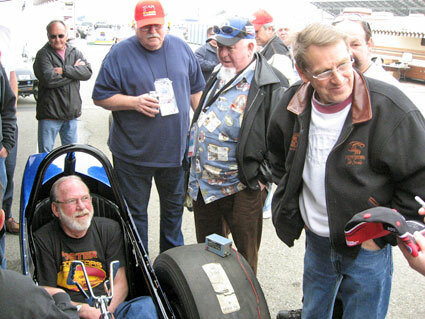 Big Show Kalitta shoe Dave Grubnic was among the many "new school" players who ventured from the Pro pits to see their history. 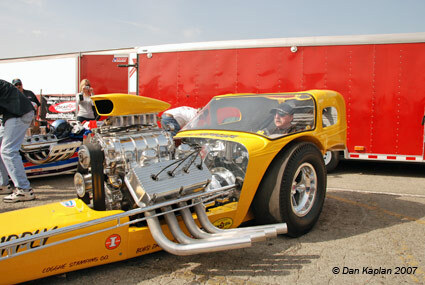 "The Poachers" car of Paul & Pam Schavrien. 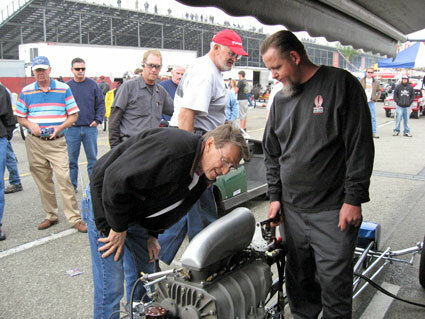 Jim Green had his "Assassin" on hand - easily one of the top 5 restorations in the world. 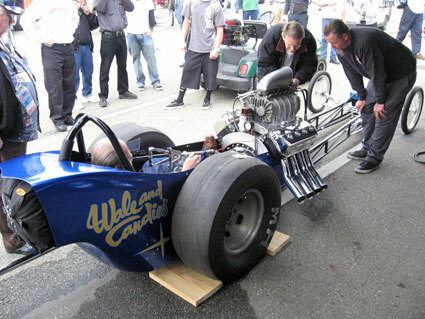 Friday was the maiden fire-up for the Wale & Candies car with Foster in the seat and Armstrong overseeing the engine. 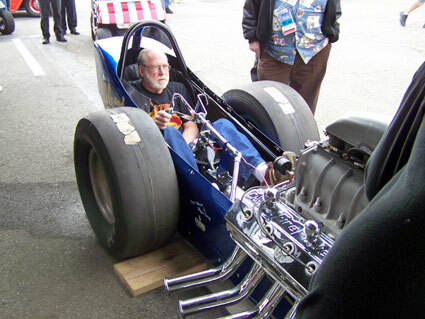 However the first attempt revealed some chinks in the armor as the idler assembly didn't hold up to the stress of the snout starter. 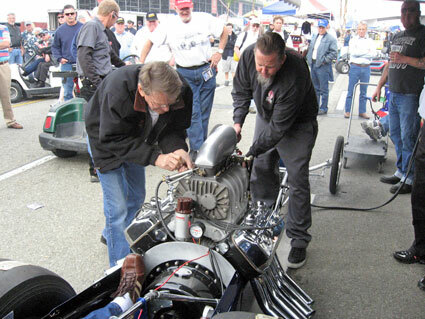 With help from Bob Danly and John Ewald the repairs were made. 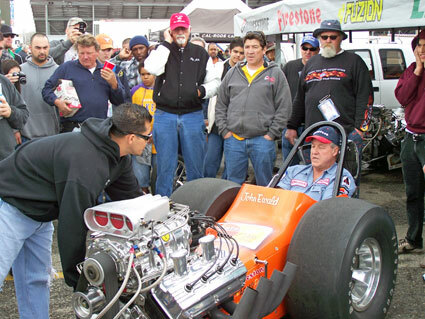 As his car was readied, Paul Candies was doing what he always did best, interact with friends and fans and then look forward to writing the checks at the end of the month. 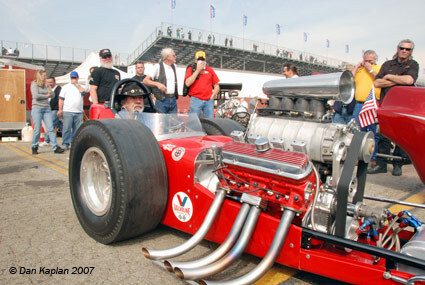 With the engine fired, Armstrong adjusted the barrel valve and got a good, crisp idle. 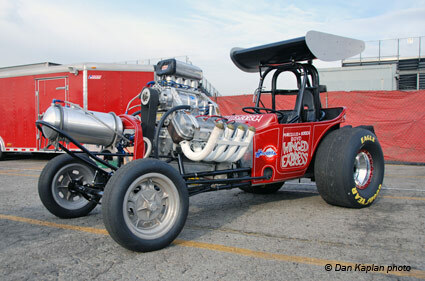 Running smooth, the car was ready for Cacklefest. 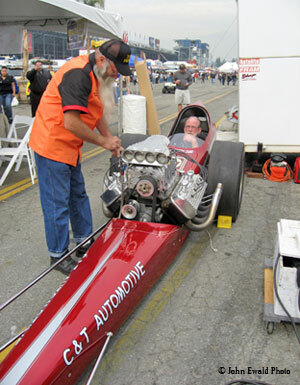 Bill Alexander in place for his Ernie's Camera "Shudder Bug" fire up. 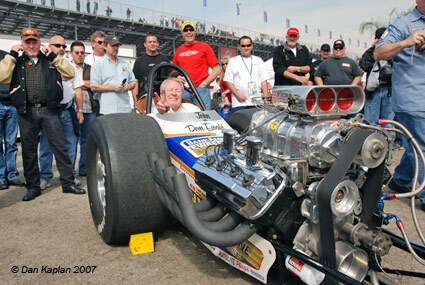 Retired Top Fuel and Funny Car driver John Collins was in the seat of John Ewald's "Mastercar". 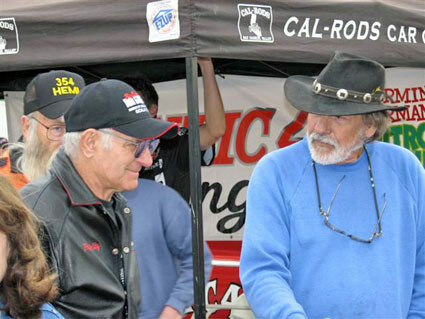 Here he catches up with Ronnie and Jeep Hampshire. 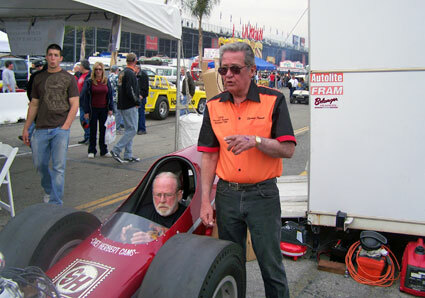 Gary Cochran ready in the Stellings & Hampshire car. 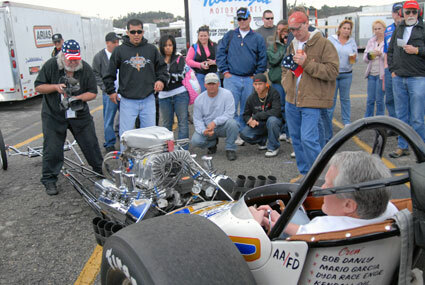 Don Ewald waits for his turn in the BankAmericar. 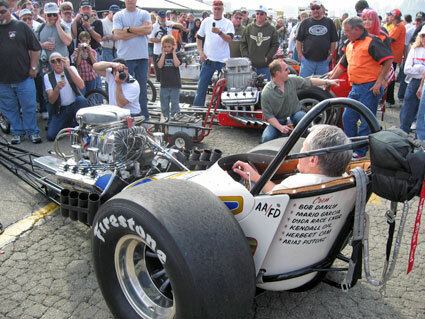 First to fire was the Kuhl & Olson car - a Cacklefest staple from day one. 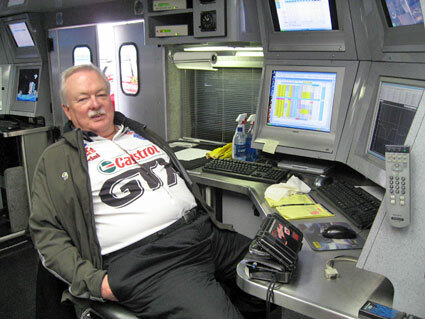 Carl Olson looking lost in the K&O cockpit. 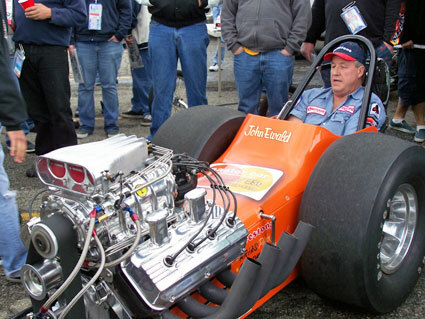 Al Bergler rumbles his "More Aggravation" fuel coupe. 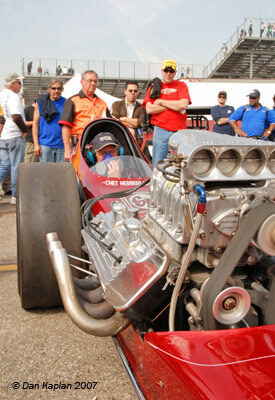 Ron Stearns joined in next. 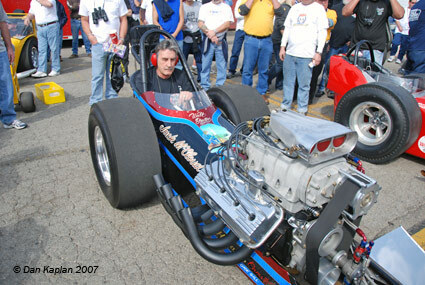 Trevor Larkin in his SBC fuel car. 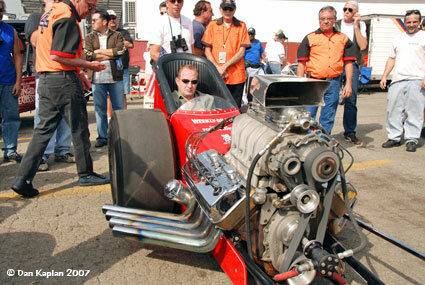 No name but the guy in the Frantic 4 car is an Indy car shoe. 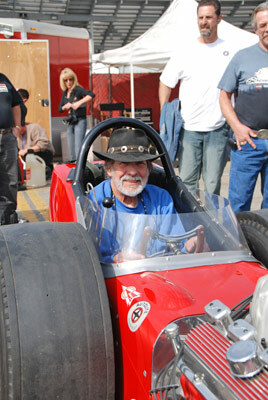 Original driver Walt Stevens in The Poachers. 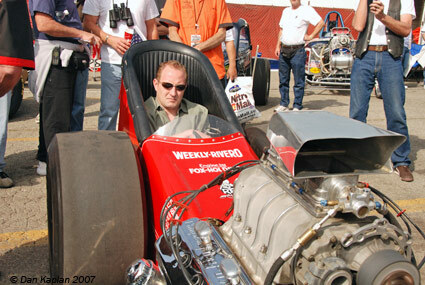 Rod Alexander prepares to fire the Shudder Bug. The stout Pontiac sounding great on 90%. 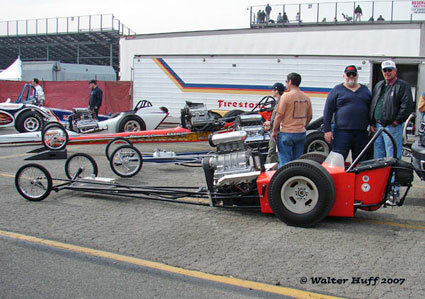 Gary Cochran in the Stellings & Hampshire car was next to fire. 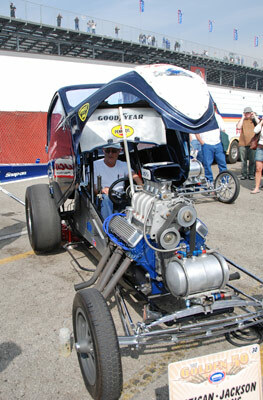 "Fast Jack" Beckman got the seat in the Howard Cams Rattler. 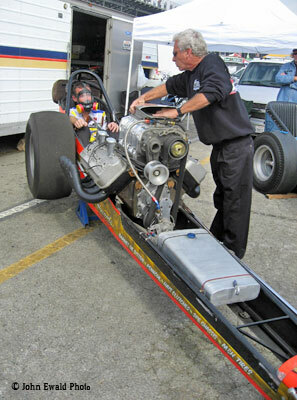 John Collins in the seat of a Top Fuel car for the first time in 36 years. 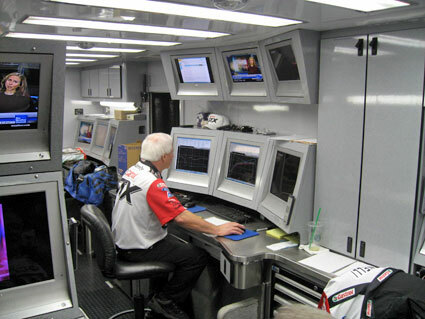 As all of us have experienced, all his racing memories flooded back during the 4 minute run time. 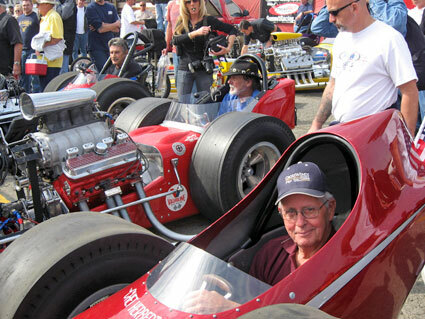 Don Ewald enjoyed his memories in the BankAmericar. 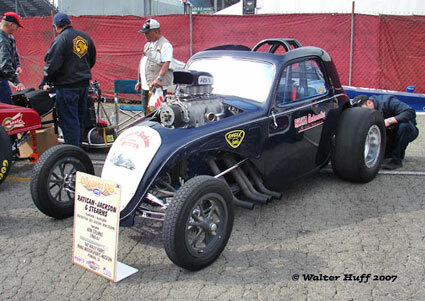 Foster closed the show in the Wale & Candies beauty. 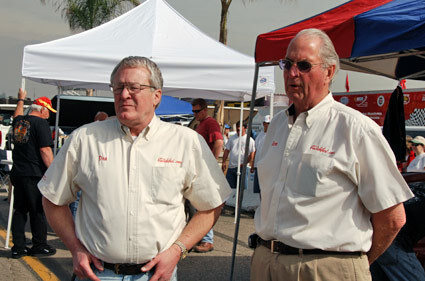 Don Ewald and Ron Johnson of Cacklefest.com oversee the awesome display of cars. 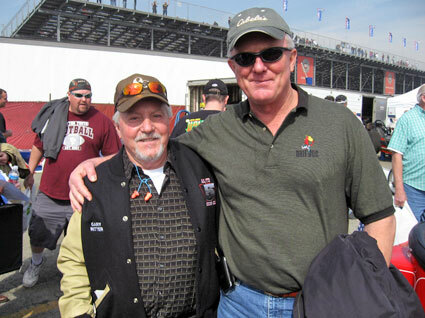 Two old vets, Gary Ritter and John Collins. 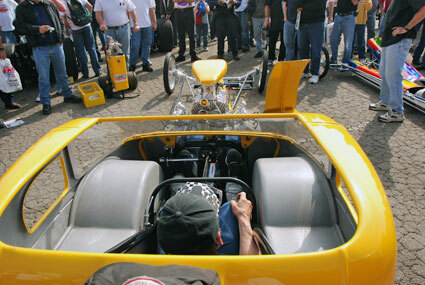 Sunday - 10 AM - this photo says it all. At this point all knew the Cacklefest was toast and there was no guarantee the Big Show would get off. 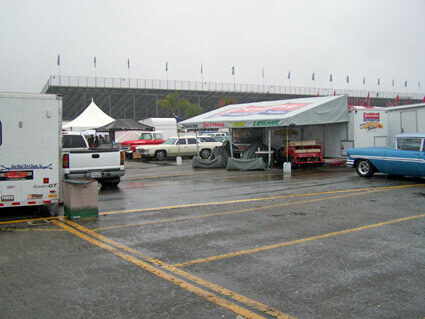 By 11 AM the rain stopped and the task of drying the track began. 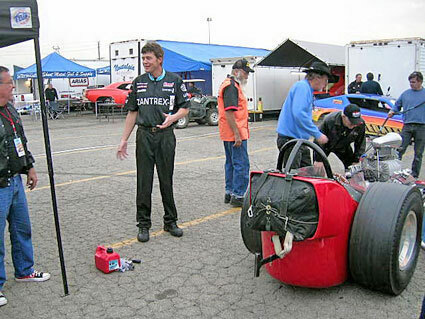 To heat things up, Pat Foster jumped from the Candies car into the S&H car for another fire up. 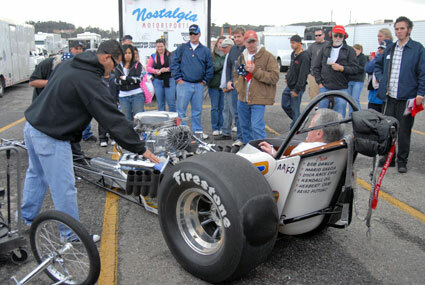 Not ones to sit around and let a little rain spoil the fun, John Ewald jumped into his Mastercar to wake the folks up. 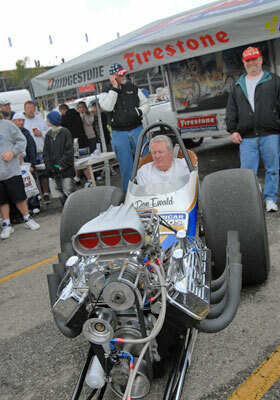 After John, Don Ewald fired up the BankAmericar. 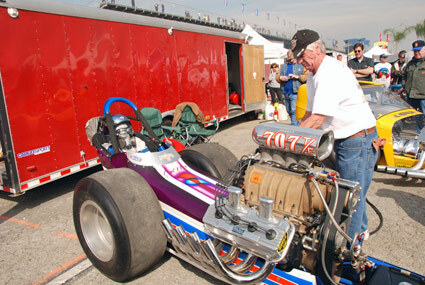 Bill Pitts' "MagiCar" didn't come up from San Diego until Sunday morning - just in time to find out the show was called off. 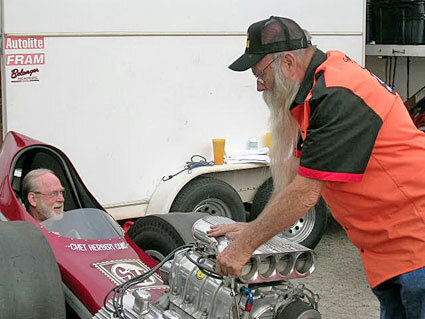 So, as to not make it a totally wasted trip, he put Jeep Hampshire in the car for a fire up. 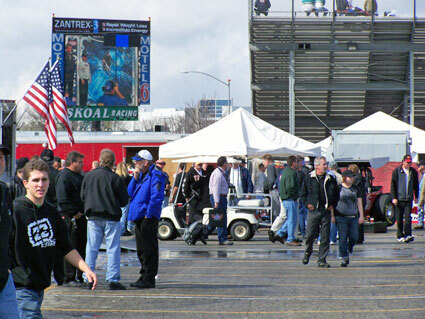 It was a great diversion for the fans waiting for the track to get dried. 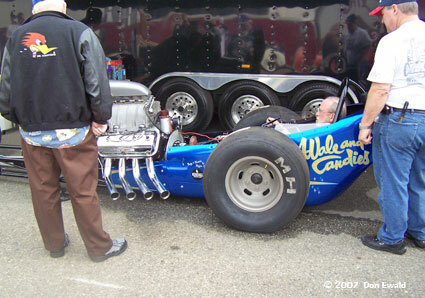 Another car that was a Sunday arrival was Jay Carpenter's dual engine "Syndicate". 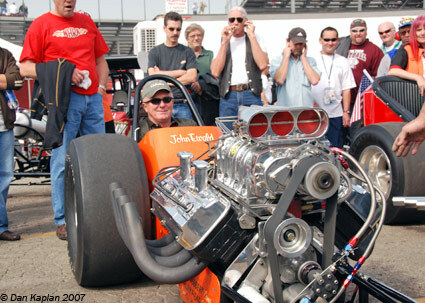 Jay fired her up and it was 16 cylinders on nitro. There was plenty of time for visiting on Sunday. 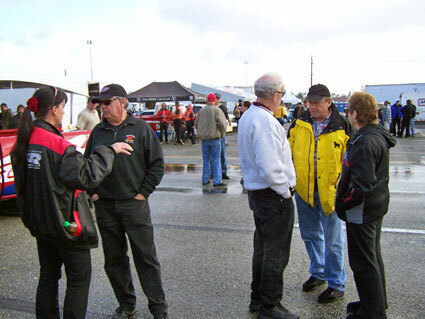 Here Carl Olson and who chat while Dave McClelland and Gordy Bonin exchange lies. 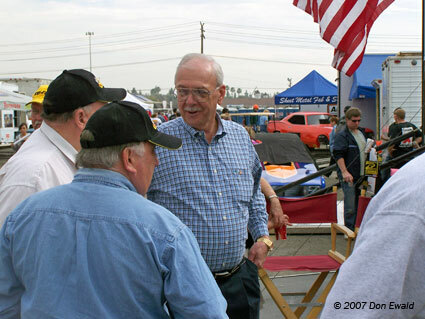 Henry Walther, Paul Candies and Pat Foster. 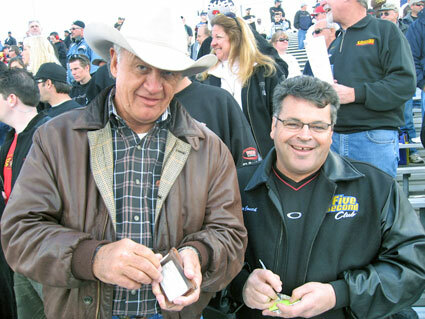 As racing finally got under way, we find Richard Tharp and Donnie Couch exchange numbers. 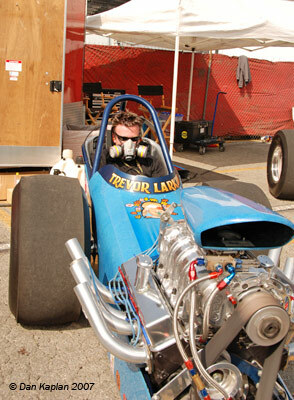 Or, Tharp is paying off a bet. 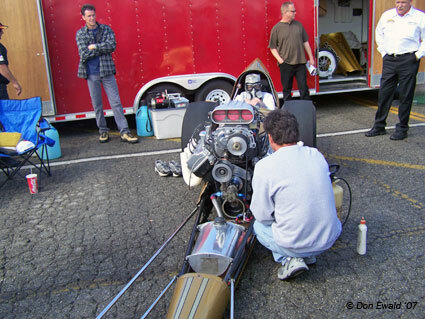 Since we didn't have a Cacklefest and that left us way short of photos, here's a few shots by John Ewald of how the other side lives at the races. 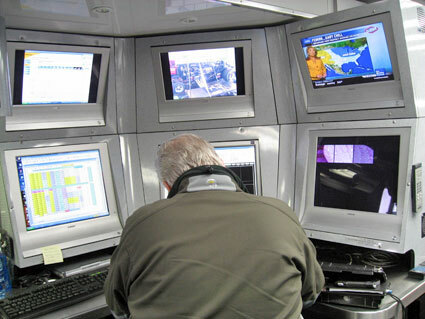 Above in John Force Racing's Bernie Fedderly in his office while Austin Coil toils in his. 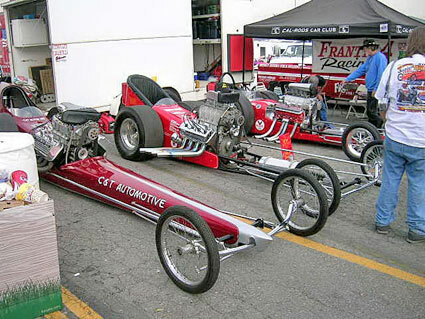 Very cool, right? But are they having fun? 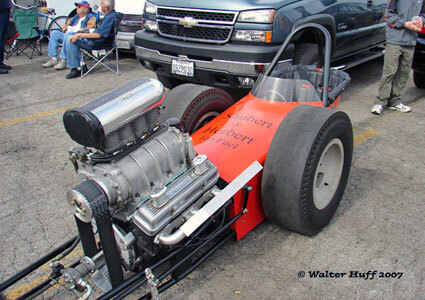 Force or not, sometimes all the best "stuff" money can buy can't get you past the first round.